You can enable a member contact form that allows your members to be emailed without revealing their email addresses. In this way, members can be contacted while still maintaining their privacy. The member contact form can be enabled for all members, or enabled only for selected members. The form can be made visible to members only or to all visitors to your site. When the member contact form is enabled for a particular member, a Send message button will appear within the member's profile. Visitors to your site can view a member's profile by clicking on the member's listing within a member directory. 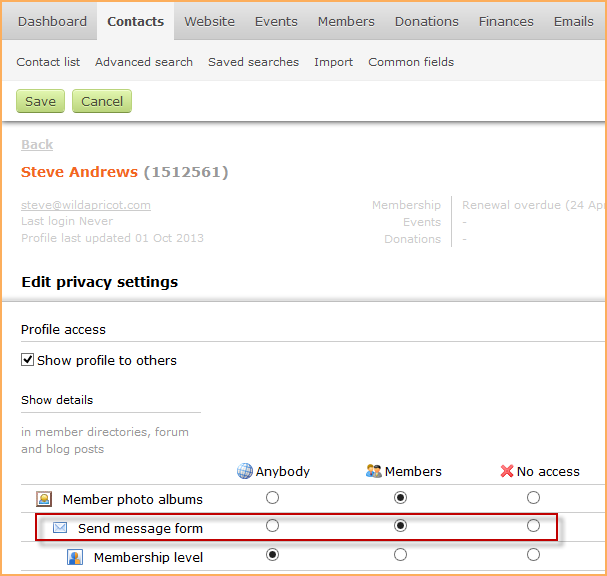 Clicking the Send message button will display the member contact form. 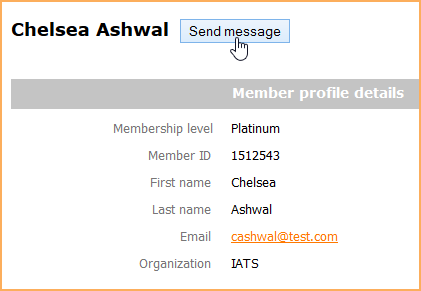 Clicking the Send button will send an email message to the member from your organization. The message will let them know that they are being contacted from your site and include the information that the visitor filled out on the form. If they wish to contact the correspondent directly, all they have to do is reply to the message in their email program. The message will be recorded in the email log where it can be viewed by a site administrator. You can enable or disable the member contact form for all future members (other than those added through import), and optionally, apply your changes to existing members. 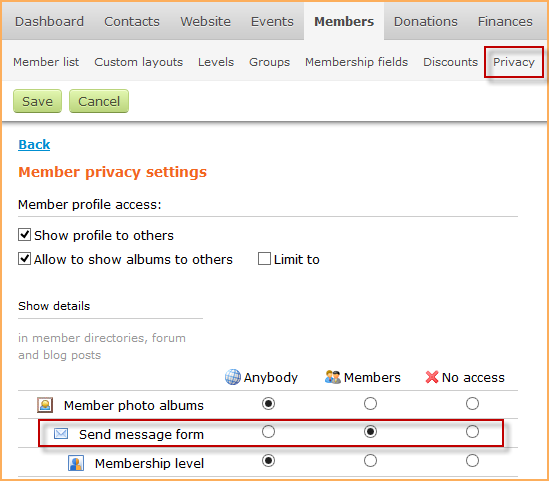 For the Send message form setting, choose whether to make the form visible to everyone, to members only, or to no one. You will be asked whether you want to apply these changes to existing records as well as new records. If you only want to apply these changes to new records, click the Leave existing records alone button. If you want to apply these changes to all existing records as well, click the Apply to all records button. You can enable or disable the member contact form for individual members without affecting the settings for other members. Open the contact's record by clicking on it within the list. From the their member profile, members can change their privacy settings, including whether to enable the member contact form. Log into their Wild Apricot account. Go to their member profile by clicking on their name. The member can now choose whether to enable the member contact form. Once they are finishing changing their privacy settings, the member clicks the Save button. To prevent automated software – known as spambots – from using the member contact form to bombard you and your members with spam emails, you can enable Wild Apricot's anti-spam Captcha feature. 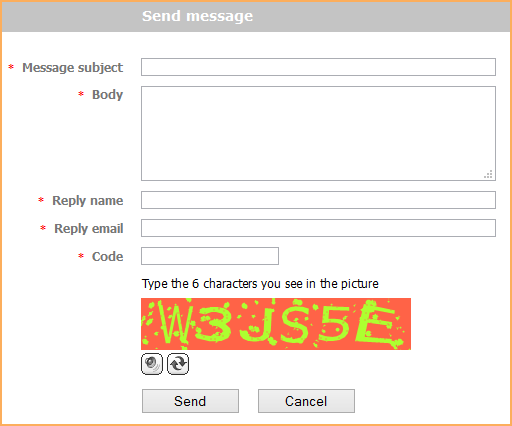 With Captcha enabled, visitors to your site would have to enter a set of characters – proving them to be a person rather than a program – before being able to send the member a message. The Captcha message is always enabled for visitors using the member contact form. Within your anti-spam settings, you can choose whether to enable it for members as well. To enable Captcha for members using the member contact form, go to Settings, and click Anti-spam settings (Captcha) under Security. On the screen that appears, click the checkbox beside Send message form under the Members heading then click Save changes.